When you enter Shenandoah National Park, you will be on Skyline Drive, the National Scenic Byway route to many points of interest in Shenandoah. Maybe the best way to get a handle on all things Shenandoah is to stop at one of the National Park Service Visitor Centers, where you can find out about all the points of interest ahead of you. Backcountry permits, Junior Ranger information and passport cancellations are available at the visitor centers. Dates/times of operation vary, so check the Park's visitor guide or park bulletin boards for current hours. 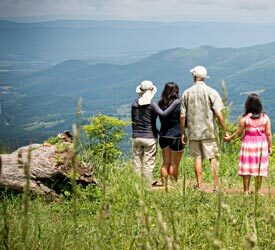 In addition to Skyline Drive scenic overlooks, hiking trailheads and visitor centers, Shenandoah points of interest encompass park lodges, restaurants, and gift shops. Pick up the park’s official visitor guide for seasonal park information. Get your free copy at any entrance station, visitor center, park campground or our Delaware North concession facilities. 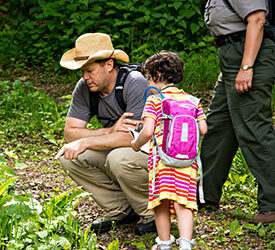 Information on points of park interest, fact sheets and maps are also available here.